I've been running CLI bots for a while and got fed up of manually entering all the trade data into a spreadsheet to track it - so I wrote a plugin to do it for me. I know I'm not the only person who was looking for an easier way to track trades... I hope (and suspect) that mikes next big gekko update will remove the need for this, but until then it should do the trick. It enters data to a google sheet via a POST request to a google form. There is a bit of setup involved, all described in the github readme... Let me know if you have any issues! You set up one google form and google sheet for all your bots. The google script automatically creates a new sheet for each pair/exchange combination it receives trades from and keeps it updated with each trade. I posted a link to an earlier version in a thread yesterday - It's been updated since then, looks far prettier now! See if it works for people, catch the bugs, then I'll work out how to do a merge request? I might have found an issue with this. I had an order 99.4% filled, then the remaining balance was too small to place a new order, and gekko didn't appear to emit a trade event. 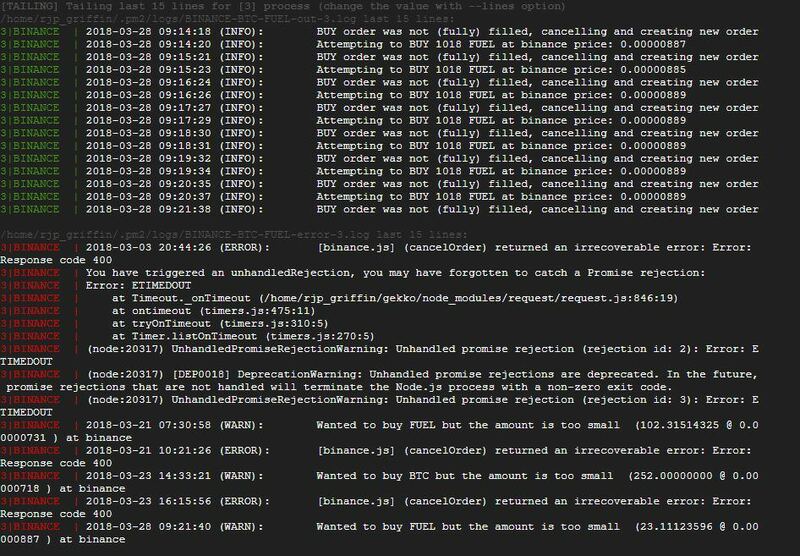 It wasn't logged on the console or sent to my plugin, but on the binance trade history I can see the partially filled order. I assume this isn't intended behaviour? My gekko vps was running an outdated copy of develop branch before the latest binance commits, so that could be the cause... All up to date now and I'll see if I have any repeats. Also, is there any reason that gekko doesn't check if there is a new highest bid price before cancelling and creating a new order at the same price? Thanks! The script will add all the graphs - just make sure you have the latest version from github The version when I first posted was very basic. If you already have pair/exchange sheets generated by an old script, probably best to rename them, wait for a trade to trigger a new sheet being generated with the graphs and formatting, then copy the trades from the first sheet across. Also I've updated gekko and haven't had any issues with mine since. i think i might have it running but slow trade day is there a way to test it and make sure the links work without it trading? When you start gekko with gforms enabled it will let you know that it's enabled along with the other plugins, just after the ascii gekko logo. Enabled does have to be set true in config, but this only takes effect when you restart gekko. I think I need to add an info message when it posts data to the forum as an indication the plugin is running! Is there a format for the ID in the CLI file currently it looks like - 'entry.1234567890=Action&' ----- is this right? on the google form do i need to set the questions as required? Is there a format the document link needs to follow? If you uncomment line 55 in the gforms.js code it will print out the filled URL to the console each trade - useful for debugging. Thank you for giving it a shot and letting me know where it's going wrong, I appreciate it.